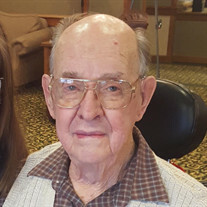 Funeral services for Lee Harrington, age 93 of Chariton, will be held Wednesday, June 27th at 2:00 p.m. at the Pierschbacher Funeral Home in Chariton. Family will receive friends prior to the service beginning at 1:00 p.m. Memorials in Lee’s memory may be made to the Lucas County Veteran’s Park or in care of his family. Interment will be at the Chariton Cemetery.